Nine dancers clad in black trousers and anonymous grey-brown shirts. A sparse light on the stage. This is the minimalist setting for the final part of the trilogy “Lost for Words“, in which the dancers from Rome circle one another restlessly with a vibrant energy, twisting in and out of each other, seeming to liberate themselves from invisible burdens. 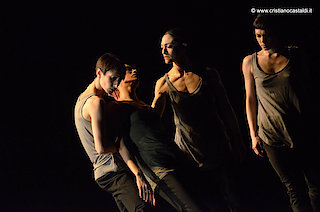 Mauro Astolfi’s dance language never ceases to astound us with its smallest details made up of starkly contrasting expressive contemporary dance styles which he continually dissects only to join them anew in a completely different fashion.